Before its final release OS X 10.11 El Capitan had been available as a public beta for some time, giving users an opportunity to test Adobe software. While I haven’t seen every user report, what I have seen indicates that Adobe Creative Cloud applications generally run at least as well on El Capitan as they did on Yosemite. As problems turn up I’ll post them here, so keep checking back. Adobe compatibility FAQs: When a new major version of OS X comes out, Adobe usually publishes a general statement on Creative Cloud compatibility. It took a while for that to appear, but that official Adobe article is here (Mac OS X El Capitan (10.11) compatibility FAQs). While I was waiting for that general statement to come out, I watched for announcements by individual product teams which are mentioned below. Some Adobe applications may not work as expected with OS X Full Screen and Split View features. This has been the case for several versions of OS X. Adobe often uses its own window drawing code that can provide additional useful features, but at the expense of compatibility. Photoshop CC 2015: For the best compatibility with OS X 10.11 El Capitan, make sure you’ve updated to the most recent version of Photoshop CC. If you’re using an earlier version of Photoshop CC 2015.1, the Photoshop team has posted an article (Photoshop and El Capitan | Mac OS 10.11) listing known issues including various delays and sluggishness with specific actions, and a graphics glitch when using Image Size. This help document contains a link to download a new Adobe “OSXCompatibility.plugin” file that is supposed to be an interim fix for many of the existing glitches, but you don’t need to use that plug-in if you’re running Photoshop CC 2015.1 or later. Photoshop CC 2015.5 introduced an incompatibility with El Capitan printing that may result in unexpected color or tone shifts on printed output (link goes to a Lightroom discussion, but the same problem exists in Photoshop CC 2015.5). This problem was fixed in Photoshop CC 2015.5.1 and Lightroom 6.6.1/CC 2015.6.1. Adobe continues to collect reports on the Photoshop feedback site where you can vote up and comment on issues that are affecting you, or report problems that aren’t already in there. If you import images from cameras using the Photo Downloader that is part of Adobe Bridge, refer to an Adobe article about this issue (Bridge does not recognize some devices on Mac OS 10.11). This problem was fixed in Bridge CC 2017. Adobe Camera Raw: If your Mac crashes after installing Adobe Camera Raw 9.12 and your Mac has Intel 4000 graphics and runs OS X 10.11, Adobe suggests upgrading to macOS 10.12 Sierra. If upgrading OS X isn’t an option, try rolling back to an earlier version of Camera Raw. Adobe Bridge CC 2015: If Bridge crashes when you browse folders and media in El Capitan, especially on multiple-display configurations, Adobe has more info (Adobe Bridge CC and Bridge CC 2015 crashing on Mac OS X). This problem was fixed in Bridge CC 2017. Lightroom CC 2015: The Lightroom team has posted an article (Lightroom and El Capitan). “Lightroom Queen” Victoria Bampton is also watching for issues (Lightroom and El Capitan Compatibility). Tethered shooting with Nikon and Leica cameras was originally broken by El Capitan, but are now working in the Lightroom 2015.4/6.4 update. In the case of Nikon, it was because Lightroom uses the Nikon SDK and was waiting to receive and test an El Capitan-compatible update of that component from Nikon. Apparently, Leica tethering is still not working. If you’re having problems using the OS X Full Screen or Split Screen modes with Lightroom, or if you’re getting unexpected shifts in color or tone when you print, make sure you’ve updated to Lightroom CC 2015.6.1/6.6.1 which resolves many of these Mac-specific issues. Acrobat DC: If you enter OS X full screen mode, most Mac applications let you exit full screen mode with the Esc key or Control+Command+F. In Acrobat, the Esc shortcut doesn’t exit full screen mode, so use Control+Command+F. A reader noticed that in Premiere Pro CS6, the dialog box for linking or relinking media is missing its title bar. When relinking media, this means you can’t see the filename of the document you’re trying to relink to. There doesn’t seem to be a fix. This problem is discussed in the Adobe Communities forum for Premiere Pro. This does not happen in Premiere Pro CC because the Relink Media dialog box was redesigned. After Effects CC: The Adobe After Effects team has posted an article (After Effects ready for Mac OS X v10.11 (El Capitan)) that says After Effects CS6 through CC 2015 have been tested and no new issues turned up. Metal: Apple claims that the new Metal API speeds up graphically intensive software. In presentations about El Capitan, Apple used Adobe After Effects as an example, citing an 8x improvement in rendering times. It is not yet clear how real these gains are across Adobe Creative Cloud applications. I’ve seen some on social media misinterpret Apple’s After Effects demo figure as if it means all Adobe software will see an immediate 8x speed boost; that’s a gross over-generalization. On Twitter, Adobe clarified that the Metal demo showed a “preview” of “1 possibility” in After Effects. We should probably not expect widespread Metal acceleration in current versions of Adobe software, but in the future Adobe will probably take advantage of Metal where it makes sense, as they recently have in several applications with OpenCL graphics acceleration. In June 2016, Adobe added Apple Metal as a GPU acceleration option for both Adobe Premiere Pro CC 2015.3 and Adobe Media Encoder CC 2015.3. However, Adobe has mentioned that this is “initial support” only. On my older Mac configuration OpenCL is still much faster than Metal, but I heard from a user with a newer Mac Pro that Metal was faster than OpenCL for them. If you’re upgrading from OS X 10.10 Yosemite, OS X 10.9 Mavericks, or OS X 10.8 Mountain Lion you probably won’t run into any new surprises. But if you’re making a bigger jump from an earlier version of OS X, or from Adobe software earlier than CS6, you may find issues that affect your migration. In many cases you can clear up problems by reinstalling the Adobe software. Note that CS2 applications, including Photoshop, were written for Macs with PowerPC CPUs. OS X 10.11 El Capitan only runs Intel CPU-compatible software, so El Capitan will not allow CS2 to run or install. Adobe CS3, CS4, and CS5 applications should run, but Adobe does not officially support them on El Capitan and there may be problems. I upgraded a test Mac to El Capitan with those versions of Photoshop already installed and have been able to run them, as shown in the figure below, after running the Java installer mentioned later in this article. License activation and deactivation work fine. Registration might not work, but registration is not required to run the software. I have not tried printing or serious editing with those versions. 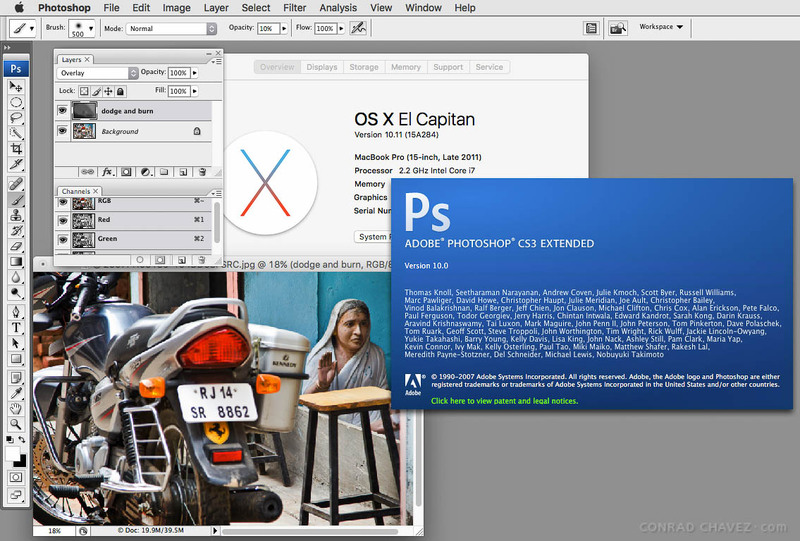 Photoshop CS3 and up will run in OS X 10.11 El Capitan. In Photoshop CS6 in OS X 10.8 through 10.11, if you are having problems with keyboard shortcuts or brushes, including lags when painting, and especially with a Wacom tablet connected, you may need to install the “white window workaround” plug-in and try updating your Wacom driver. Photoshop Elements 11: A reader reported that Photoshop Elements 11 is freezing when saving a document in El Capitan. There’s an Adobe Communities forum thread with other reports about it; if anyone knows how to solve this please reply in the comments. OS X Gatekeeper may prevent older Adobe software from starting: Gatekeeper is an Apple security feature (added in Mountain Lion) that helps protect you from running malicious applications. If you run Adobe software released before Gatekeeper, you should know what to do if Gatekeeper prevents Adobe software from starting. Adobe covers that in this tech note: Error “has not been signed by a recognized distributor” | Launch Adobe applications | Mac OS. The short answer is to bypass the error by right-clicking the application icon, then choose Open from the context menu. Depending on the Mac you use, instead of right-clicking you can also Control-click, or if you have a trackpad set up for two-finger secondary click you can do it that way instead. Intel compatibility required: If your Adobe software is earlier than CS5, to run under El Capitan at all it must support Intel processors. After Apple switched to Intel-based Macs, Apple started phasing out support for running software based on the older PowerPC processors. Starting with Mac OS X 10.6 Snow Leopard, Mac OS X no longer runs PowerPC-based software. You’ll have to check compatibility for each of the Adobe applications you want to run; for example, Photoshop CS3 was the first version of Photoshop that ran on Intel-based Macs. But even if your software older than CS5 runs on El Capitan, it may still have other issues because OS X has changed a lot since then. To learn about OS X software compatibility of Mac software in general, one resource is the Roaring Apps database. It lists OS X software and its reported compatibility with the last few versions of OS X, and it’s crowdsourced from user reports which are said to vary in reliability. As always, for any software that you cannot afford to be without, you should do two things: Check that company’s support website to verify compatibility, and also set up a test installation of El Capitan on a separate volume (like a spare hard drive or even a large enough USB flash drive) to run tests with your own files, peripherals, and workflows. Wondering what El Capitan is all about? For the most in-depth El Capitan review you’ll probably find anywhere, read the OS X 10.11 El Capitan review at Ars Technica. As with every major release of OS X, the Ars Technica review not only evaluates the visible features that Apple promotes, but goes under the surface to explain changes to some of the underlying technologies in OS X and how they affect your Mac experience. TRIM support for third-party SSDs: If you replaced your Mac’s original internal drive with a solid state drive (SSD), depending on the brand it may be a good idea to enable a feature called TRIM for better long-term performance. There was a time during the OS X 10.10 Yosemite release when TRIM could not be enabled in Yosemite without compromising certain aspects of OS X security. Fortunately Apple later provided a way to enable TRIM starting in OS X 10.10.5, and that restoration of TRIM support is still present in 10.11 El Capitan. For the details, see Trim Enabler and Yosemite by Cindori Software, creator of the Trim Enabler utility. 10-bits-per-channel video displays: For many years, Photoshop users and other graphics professionals have wanted proper support for 10-bits-per-channel video displays (also known as 30-bit when counting the three RGB channels together) on Macs. This isn’t about the file format, but the data path to the video monitor. While 10-bpc-capable displays, graphics cards, cables, and software (such as Photoshop) have been ready for some time, OS X itself has been the last missing piece everybody has been waiting for. Finally, 10bpc/30-bit display color has appeared in OS X 10.11 El Capitan. For more information, see my article 30-bit display color is now supported by OS X and Photoshop. This article was originally posted on September 30, 2015 but has been frequently updated since the release of Mac OS X 10.11 El Capitan. After installing El Capitán my Illustrator CS5 crashes out of nowhere ALL THE TIME. I have lost so much time (and work!) today trying to work! I start working and suddenly: BANG it shuts off. Mine is doing the same thing. Every time I use the Eyedropper tool, boom! I have tried to update CS5, but it keeps failing. I’m having the exact same issue with AI CS5 after installing El Capitan. Eyedropper causes an immediate crash, as does simply Quitting the program. I’ve posted my issue in both the Adobe forum and the Apple forum, if you are interested in following to see if a solution arises. And if you find a solution please do respond here, I’ll do the same! Didn’t he say in the article to re-install the software, not update it? Wouldn’t that mean to re-install the CS5 suite/program? I ask that because I need to make sure my CS4 programs will keep working. I’ll keep an eye out on your struggles, here. I am getting the exact same problem. I avoid using it but every now and then habit kicks in. Everyone who has had the eyedropper crash in Illustrator CS5 in 10.11 through 10.11.3, do you still see this happen in OS X 10.11.4? For me, 10.11.4 seems to have fixed the eyedropper crash, though now Illustrator CS5 crashes on quit instead. Are you seeing the same thing in 10.11.4, or something different? Me too–it’s driving me CRAZY. Every time I use eyedropper, Illustrator CS5 crashes. I’ve discovered a way around it, at least for now. The problem SEEMS to only effect files created before the update. New files are letting me use the eyedropper without crashing. For pre-upgrade files that I’m working on, I’ve copied all and pasted into a new .ai file and saved it. From there, I can use the eyedropper without the whole thing crashing. I tested this tonight without a problem, so hopefully this can be a bandaid until we get a real fix. I’ve tried the cut and paste and it still crashes. Considered CC for a moment, but even the core apps I want (ID and Illustrator) cost as much as the old upgrades for the whole suite did for a year. Same problem here. Illustrator 5.5 crashes when using eyedropper after upgrading to OS 10.11 El Capitan. • Always crashes if I eyedropper a non-vector object including the background. • Sometimes crashes when when I eyedropper a vector shape too. Sampling some shapes seem to crash Ai more reliable than others. I can’t figure out what the difference is. Weird fact: If I zoom way in on a shape before I sample it, it is less likely to crash Illustrator. If I then zoom way out and sample it again, Ai will crash. I have done a complete reinstall of CS5.5 to no avail. I just got off the phone with Adobe. Seems that CS5 and CS6 is just not compatible with El Capitan. And basically you need to purchase Creative Cloud from Adobe for $49 per month to get all the applications. BUMMER! Great article Conrad. I backed up my files this weekend to do the upgrade, but hesitated to complete the install. Now I know to definitely keep my work computer with the old OS. Thanks Laura! Yes, even though most of the issues listed won’t affect me much, I’m waiting to upgrade too while things settle down. If past experience is any guide, some problems will need updates from Adobe while others will need updates from Apple. Rick, I am having the same issue with my Illustrator CS5 crashing every time I use the eye dropper tool too. I have been searching for a solution but have had no such luck, hopefully this gets resolved soon! Does El Captain work with LR 4 or 5 & Elements 11- 14? 🙂 I’m upgrading from 10.6.8 to El captain and I use LR4 on this Macbook. Did you find an answer to this? I’m wanting to know if LR4 will work with El Capitan too. Did anyone ever find out if LR4 works with El Capitan ? Amanda did you ever find out if LR$ is compatible with El Capitan ? Photoshop CS5 keeps crashing on El Captain when Printing and when Quitting the Program. Frustrating! This eye dropper tool crash on CS5 is absolutely ridiculous. If I hear one more comment from Adobe stating “ensure you have upgraded to CC” I’m going to throw a 5-year-old style temper tantrum. Forced to downgrade to Yosemite. Not worth the hassle of trying to use Illustrator CS5 with El Capitain: free is only good if it works. Apart from Illustrator CS5, Photoshop CS5 (version 12.1 x64) with El Capitan crashes a lot too ! Even image resize crashes. Did you ever find out if LR4 works with El Capitan ? My trusty 8 core ms pro, 3,1 would not install el crap. It wasted 2 days of my life trying to get it back online. apple help was worthless, insisting I install el crap when it was clear that the computer would not accept it. My pre/ install research told me it was a “go”. Not so much. Froze me up. Had to do a rolled back clean install. And roll back my graphics card to the OEM card. The whole point of my upgrade was to get it ready to accept a GTX 980. While the solution in the video may work, I don’t recommend it for two reasons. The first reason is that it’s more difficult than the official Apple download I linked to in the article. The problem with the video is that he downloaded the old 2014-001 version of Java SE 6; that’s why ran into trouble and had to manually install it. Now that Apple is providing an El Capitan-compatible version (2015-001), the Apple installer puts all of the files into the correct location with just a few easy clicks and no errors. The second reason is that it’s much safer to download the official Apple installer than from a third party. Although his download link may be valid, it is more likely that the official Apple installer is free of possible malware. Remember: One of the biggest ways a computer is vulnerable to hackers is through Java, that’s why Apple doesn’t install it by default. It’s better to make sure your Java installation comes from an official source. Thanks so if i want to download Lightroom 5 to my El Capitan I can? i know this is slightly off-topic, but has anyone tried or experienced any trouble when installing nik softwares on el capitan? Only opened Illustrator, changed a preference and closed it again. Message appears that Illustrator quit unexpectedly. The prefence-change is not saved. Any ideas about how to fix this so I can do my work? I haven’t heard of that problem and I’m not familiar enough with the InDesign Startup Scripts, but here’s what I noticed just looking at it. It seems to tie into Flash, and the error mentions Flash, so one thing to try is to make sure you’ve updated to the latest version of Flash. The last line that starts with “Source” says “Adbobe InDesign Server” but that should probably be spelled “Adobe InDesign Server” so you might try correcting the script (using ExtendScript Toolkit which is possibly already installed). Illustrator CS3 won’t even launch in El Capitan. None of my short keys or right click works in illustrator cs6 ever since I downloaded El Capitan. I need my short code keyboard back! I need to be able to work fast again. This is ridiculous! Has anyone else had this problem? Were you able to find a fix for it, I have been searching all day. After installing the El Capitan update on my MacBook Pro Retina, my Illustrator CC has been incredibly glitchy, resulting in poor productivity…SO frustrating! 1) The right-click doesn’t work if I have a dual monitor hooked up. 2) I cannot change multiple line colors using my CC Library….let me rephrase…it works 90% of the time, but not all of the time and there is no rhyme or reason as to when it does/doesn’t work. Is there any way to “un-grade” your Mac back to the last version? El Capitan has ruined my productivity. And while it’s probably an Adobe issue, I need to increase my productivity in the meantime while they get their sh”t together so I can work! I had that same issue with my illustrator not right clicking and my short keys not working on my CS6 and ended up having to get geek squad to fix the issue and even the only way they were able to successfully fix the issue was to uninstall CS6 from my iMac & use my time capsule Apple external hard drive (if u have one)..and go back to the date of before I did the update to El Capitan. This put me back to the one I had previously “Yosemite”. Then we reinstalled all of CS6 and when I tried illustrator all the short keys were back and my right click was back in business also! Btw I also use dual monitors & we did many Hours of trouble shooting before having to finally do it that way. I suggest if you fix it this way just make sure that anything you have done on the computer while having El caption is saved on a different external hard drive just to be safe. Ok, my El Capitan issues are with Premiere Pro CS6. In the past whenever I opened a specific Project file, and if any of the needed media files were missing or “offline” because they were possibly moved on my hard drive, immediately a Finder popup window on my Mac Book Pro would open and the name of the missing file would be shown on the top/center of the Toolbar. This would allow me to search my computer for the missing file to be re-linked to the Project. Now with El Capitan, this popup window still opens but the top of the Finder popup window does not show the name of the missing file. Without the name of the missing file this makes it impossible to work with the Project file. I am a loss without this because I just reorganized my hard drive and I am now using a series of external drives. HELP IS NEEDED ASAP!!!!! I talked with Steve about this and was able to reproduce his problem with Premiere Pro CS6 on El Capitan. I also found a discussion thread about it in the Premiere Pro forum on Adobe Communities. Premiere Pro CS6 will probably not receive any more updates, and the problem still occurs in OS X 10.11.1 and 10.11.2. The only immediately available solution is to upgrade to Premiere Pro CC where I found the problem does not happen, but this would require a subscription which is not an acceptable solution for everyone. Thanks for posting this. However, I don’t see InDesign mentioned and I’m currently having issues even opening it. I have the CS6 version. Do you know anything about InDesign? InDesign CS6 isn’t mentioned because I haven’t seen consistent reports of problems with it on OS X 10.11. Issues related to El Capitan don’t seem to be turning up on the Adobe InDesign user forum, so I’m wondering if that means “no news is good news.” But that doesn’t guarantee that it’s trouble-free…what problems are you running into when you try to open InDesign CS6? Need help with Indesign CS5. It boots in El Capitan but nothing works. I’ve reset all the preferences but still cannot create a new file or do anything. Can you direct me to the cure? Hi Barbara, sorry for the delayed reply over the holidays. I tried InDesign CS5.5 (not CS5) in El Capitan and didn’t have any problems creating a new file and adding text and graphics. I did find a reference to a problem that affects InDesign CS4 and CS5 on startup that sounds similar to yours, does this link help? I haven’t seen widespread reports of the problem you mentioned, so if it isn’t a common problem it may have to be addressed through standard troubleshooting. Resetting preferences is a good thing to try but since that didn’t work, we’ll have to try something else like running the InDesign CS5 uninstaller and then installing it again. I am running CS4. El Capitan literally killed all my Adobe programs. I am unable to upload any photos from my camera using the Bridge Photo Uploader due to El Capitan’s version of iPhoto, or Photo, or whatever it is called now…. basically I prefer using Adobe… anyhoo, how can this be fixed. El Capitan so far is El Capitan sucketh very badly. Need a solution other than spending another fortune for a program I prefer to use offline, as in no internet link. 10.11.4 upgrade: Dreamweaver 5.5 crashes every time you to try to search and replace. Have not found any other issues yet, but this is a bad sign. Time to switch to competing products, I am just not willing to pay the Adobe tax….